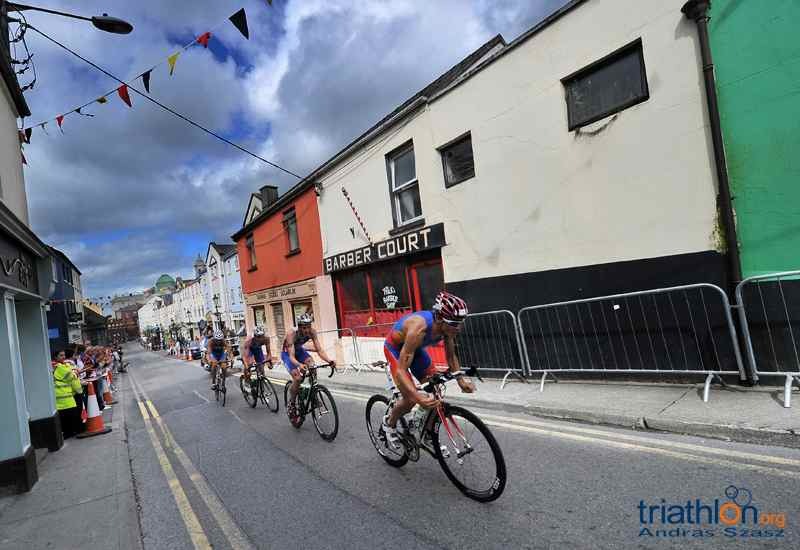 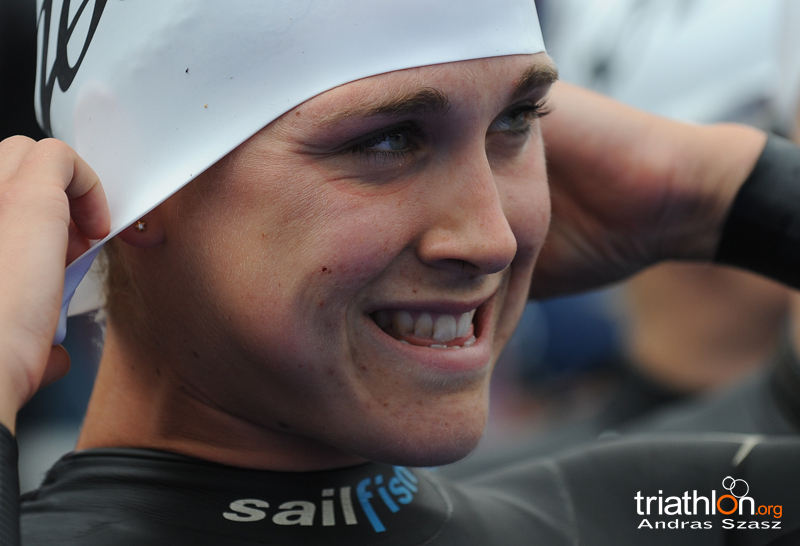 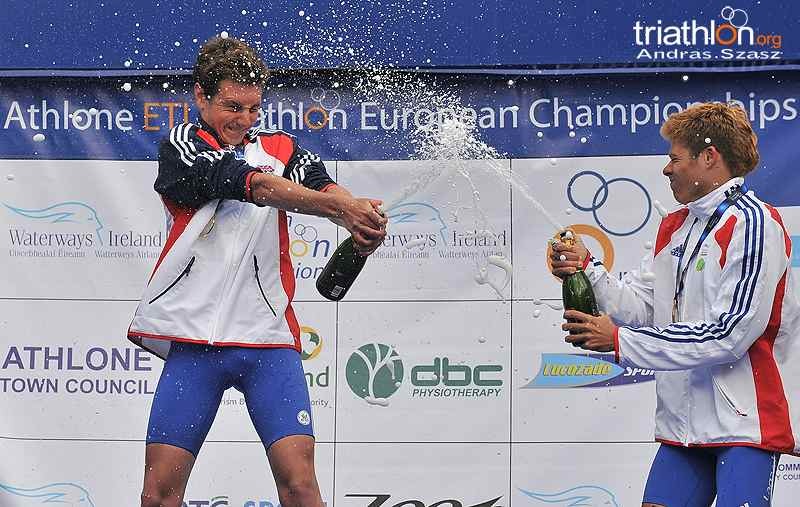 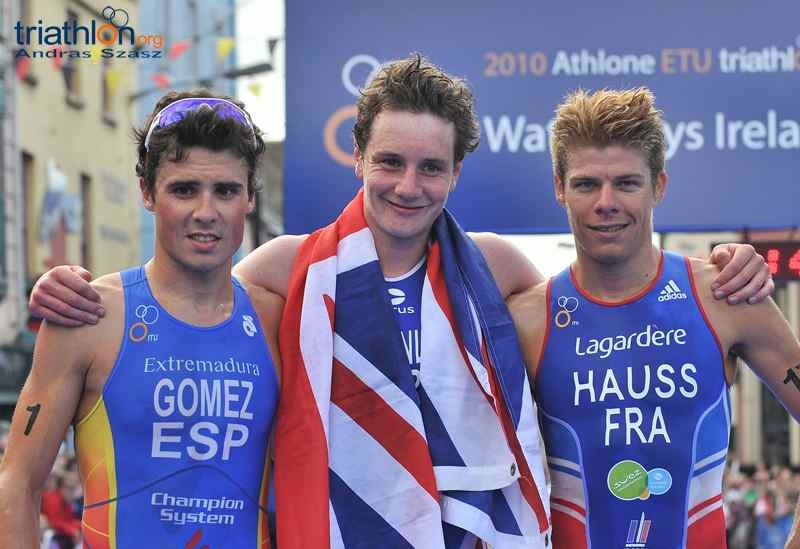 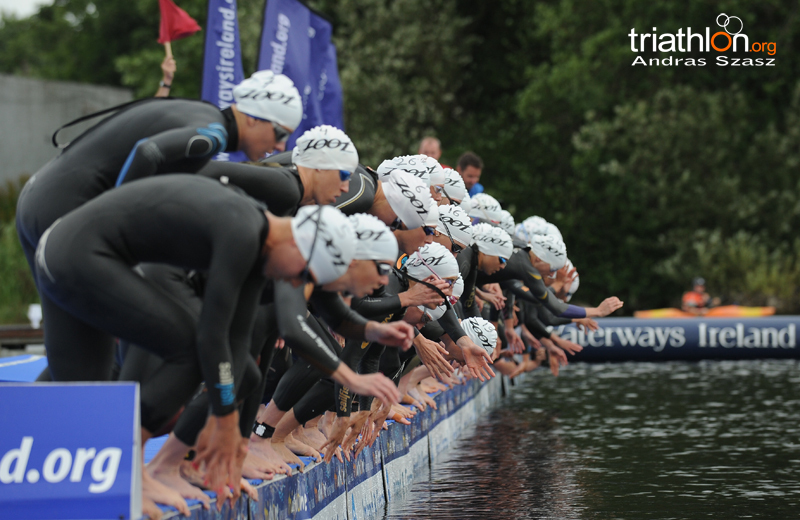 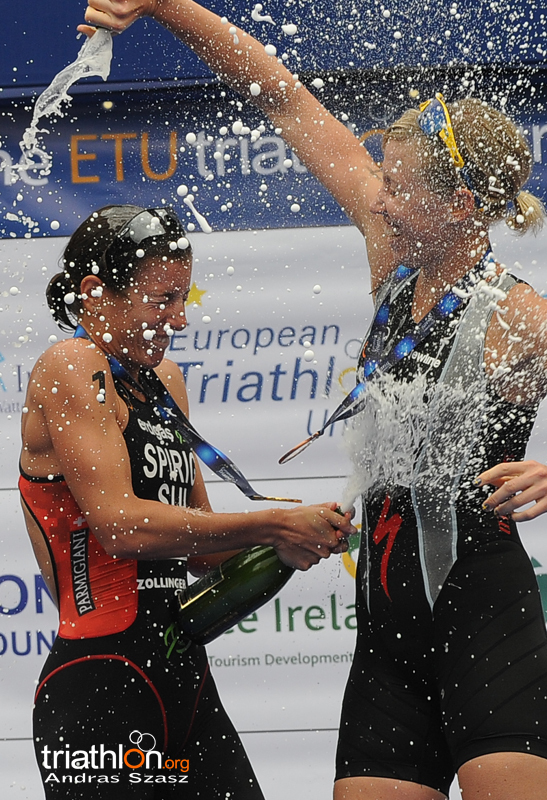 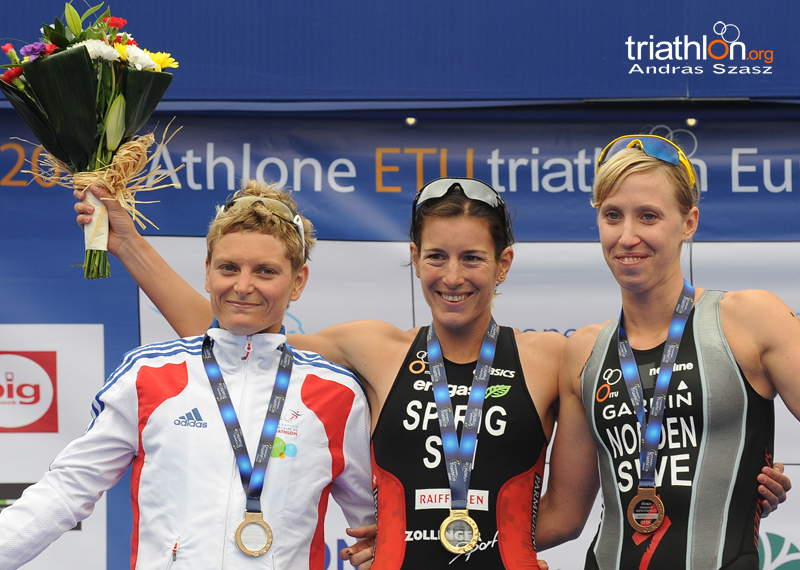 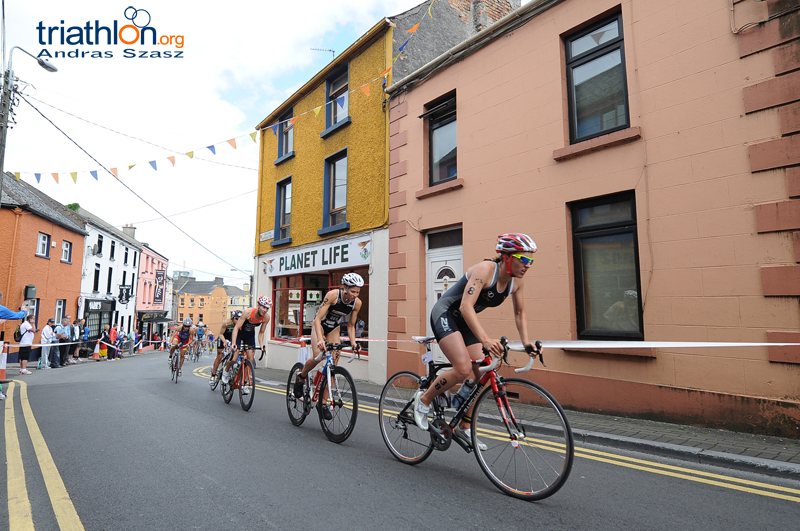 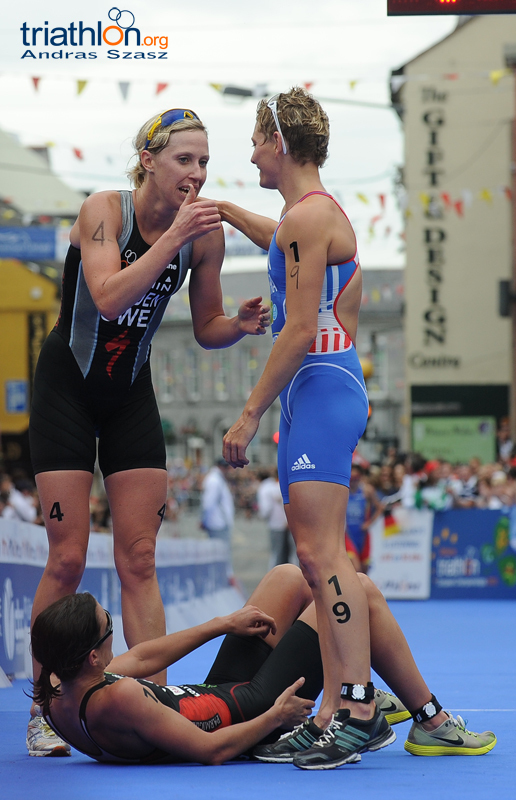 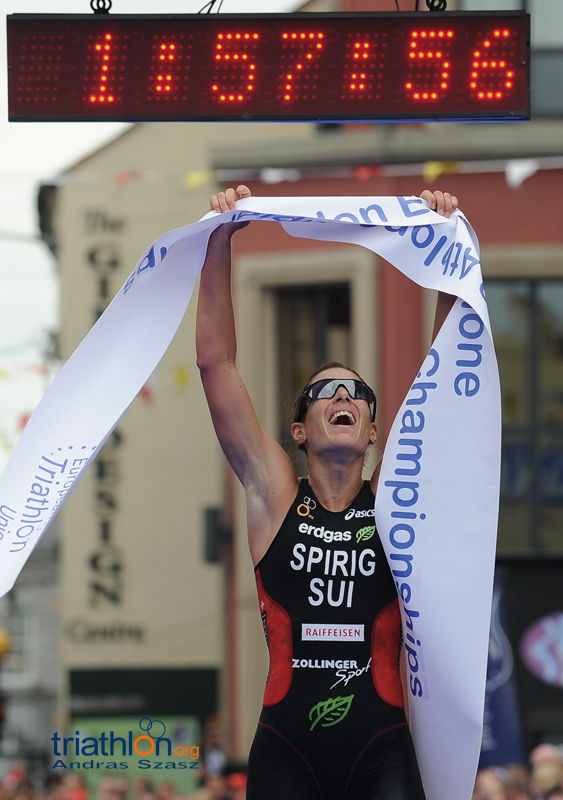 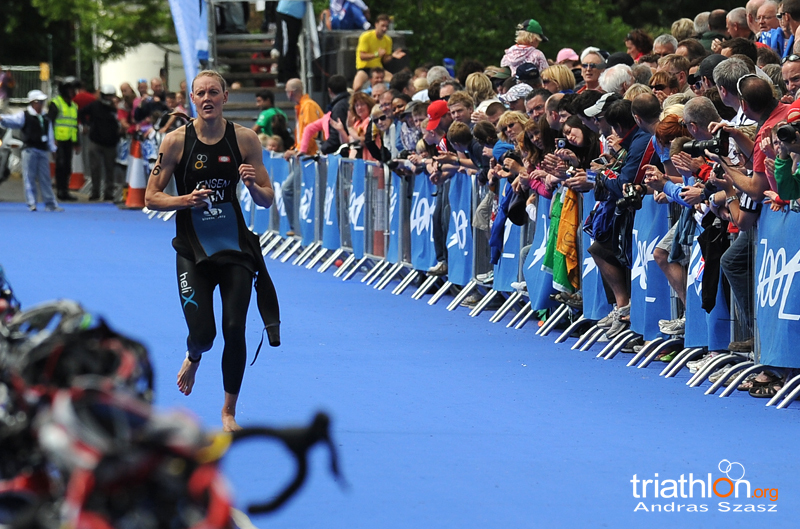 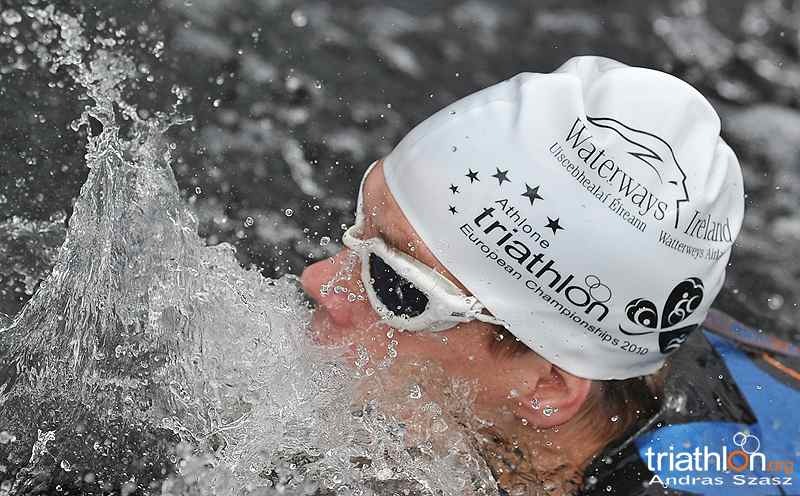 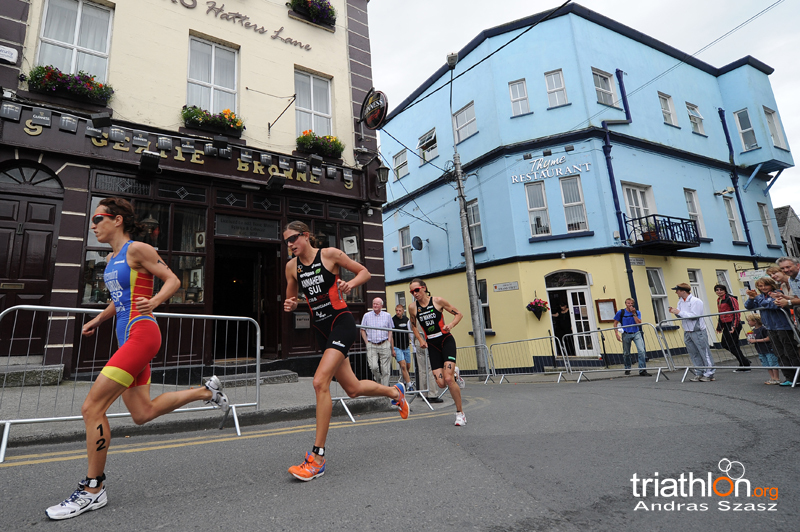 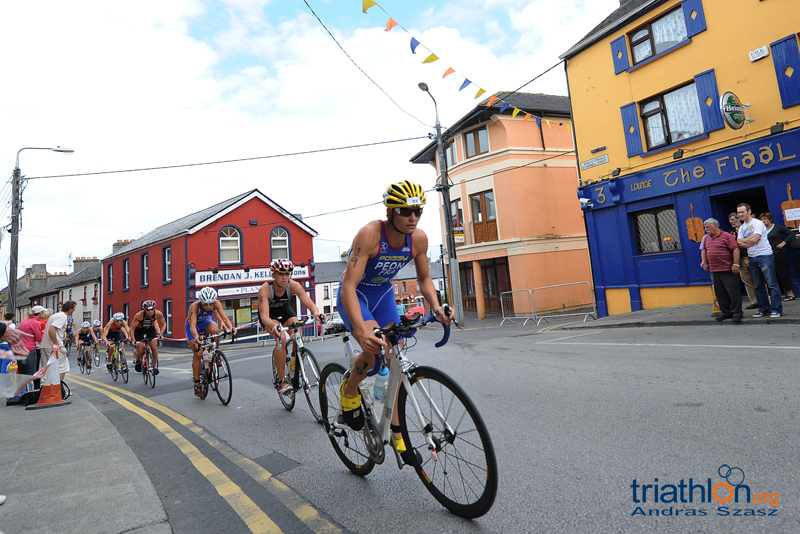 Switzerland’s Nicola Spirig won her second consecutive ETU Triathlon European title on Saturday in Athlone, Ireland, topping France’s Carole Peon by 12 seconds. 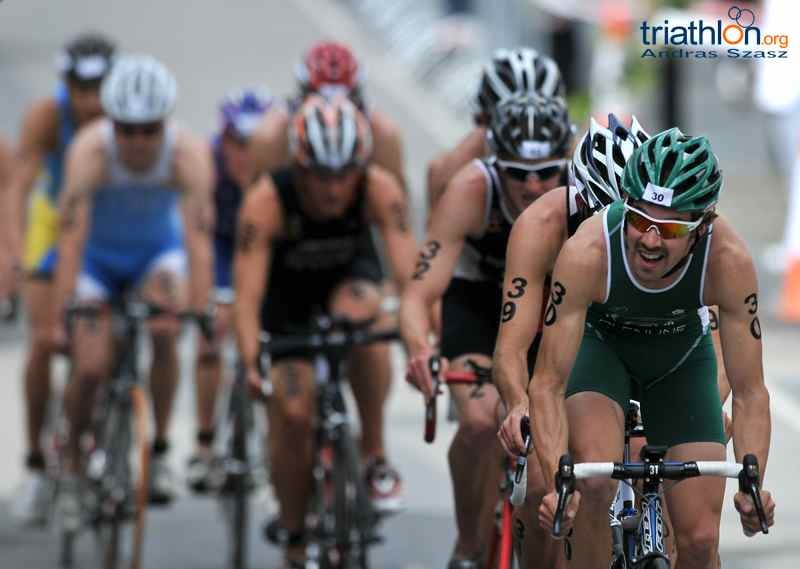 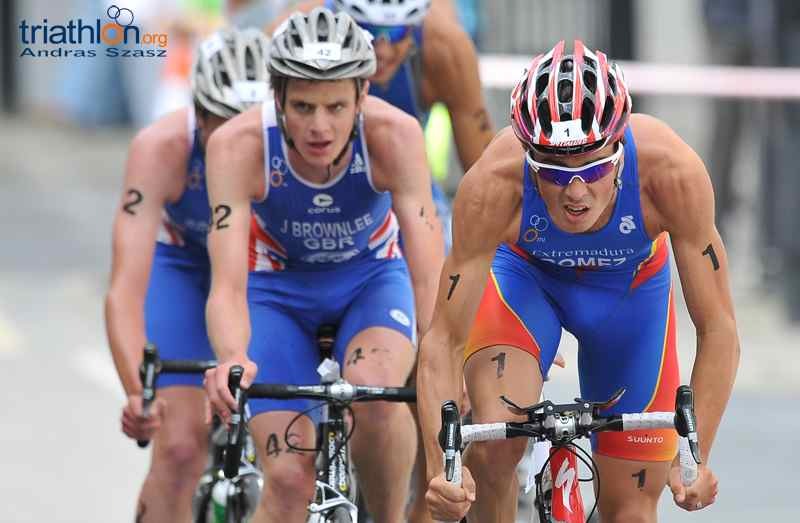 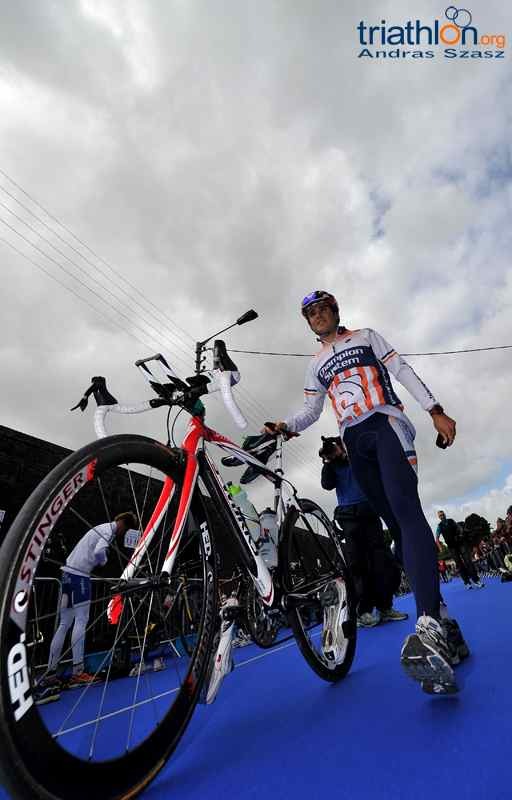 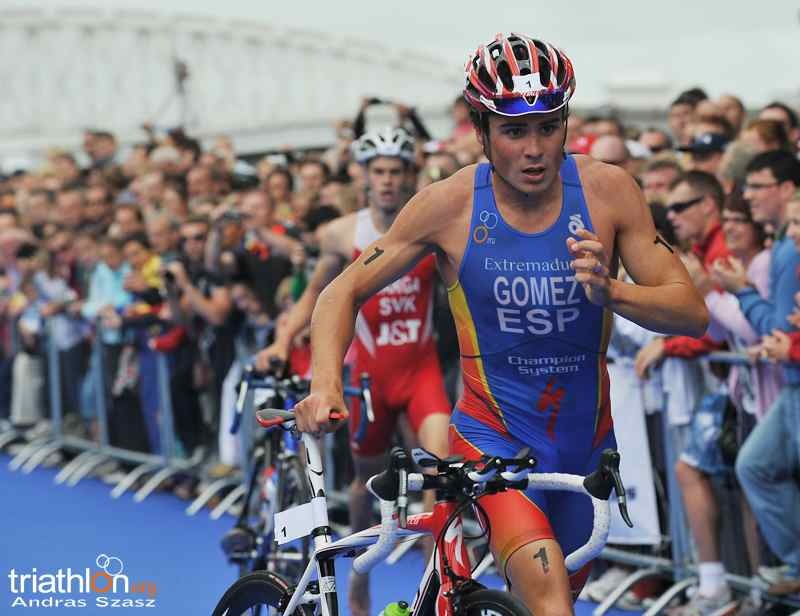 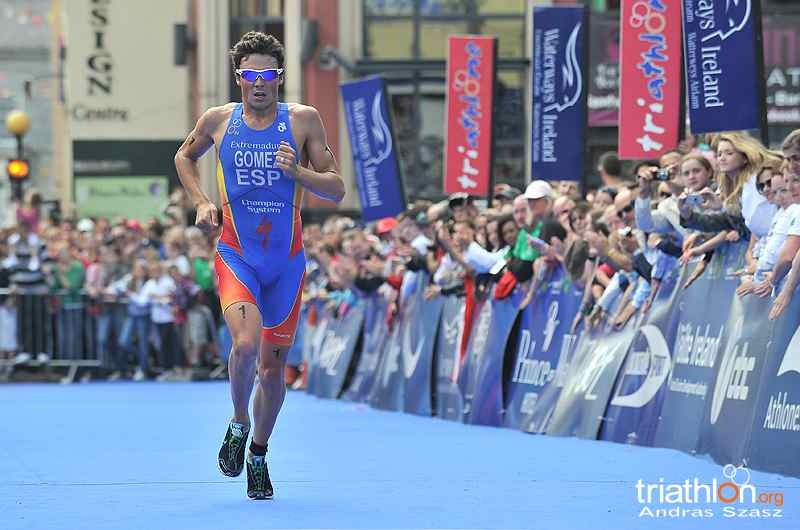 The win comes only one month after Spirig won the third round of the Dextro Energy ITU World Championship Series in Madrid. 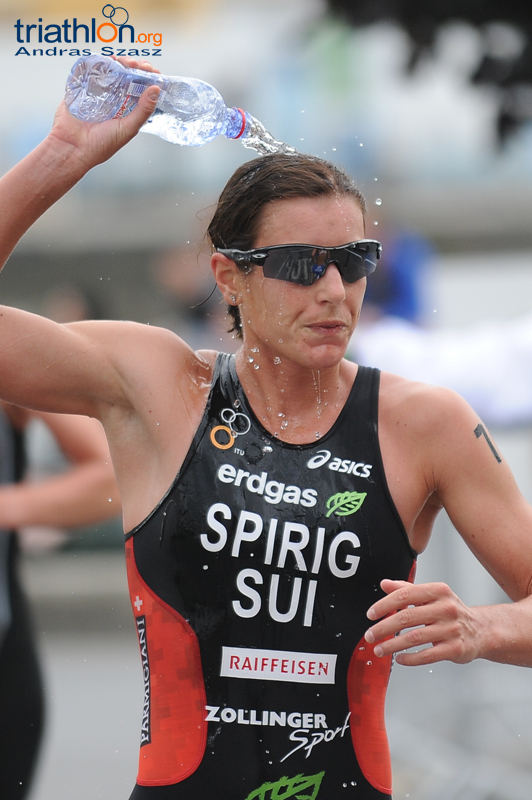 It’s also the third consecutive major win for the Swiss women, as teammate Daniela Ryf won the second round of the Series in Seoul in May. 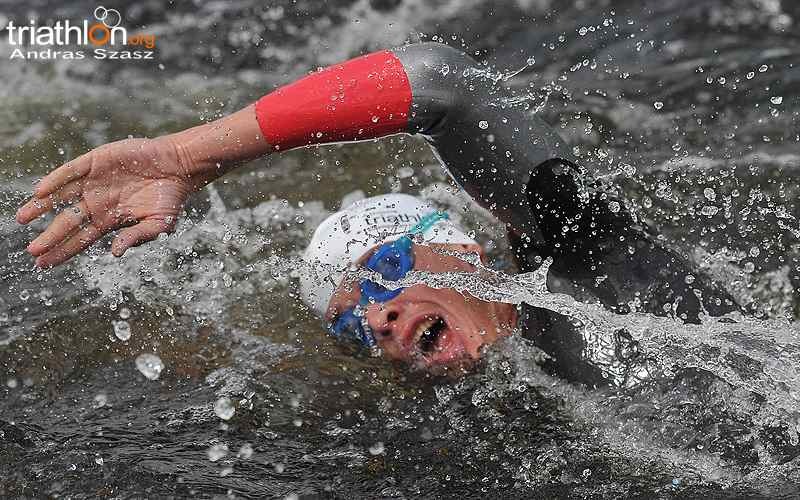 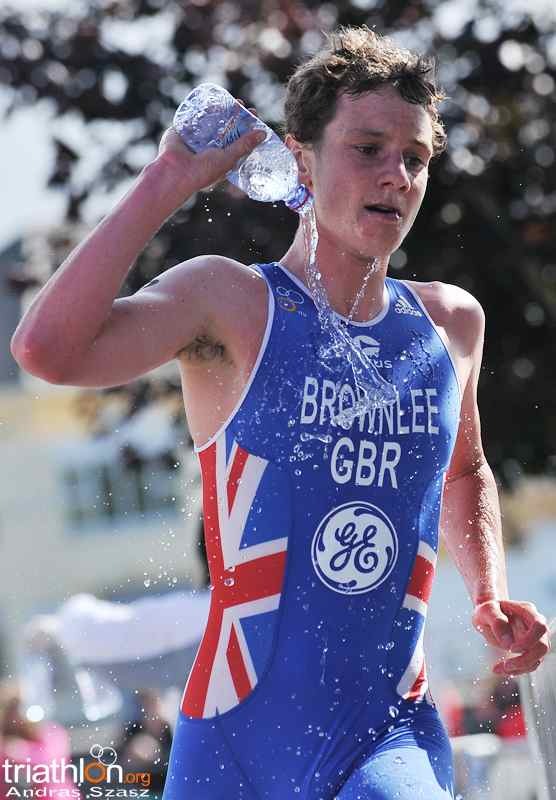 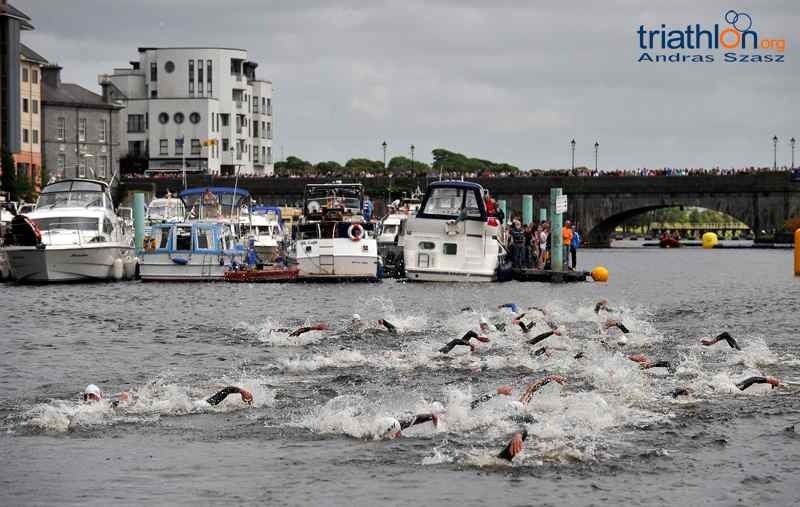 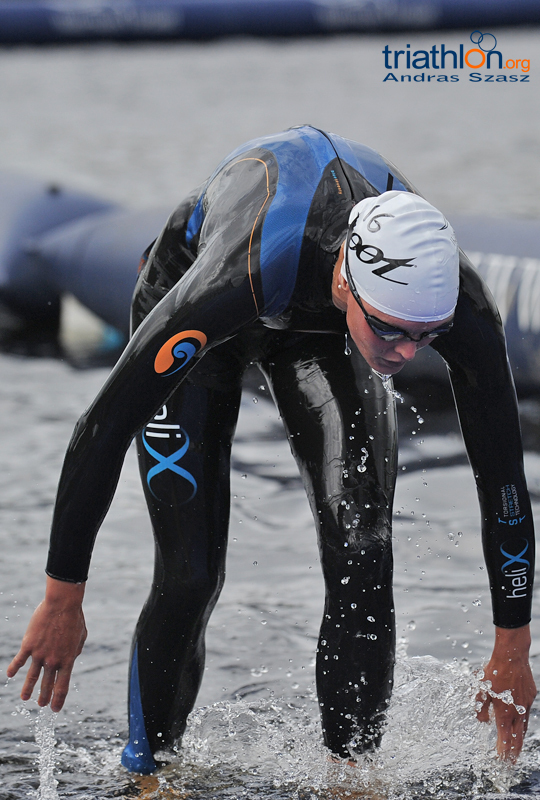 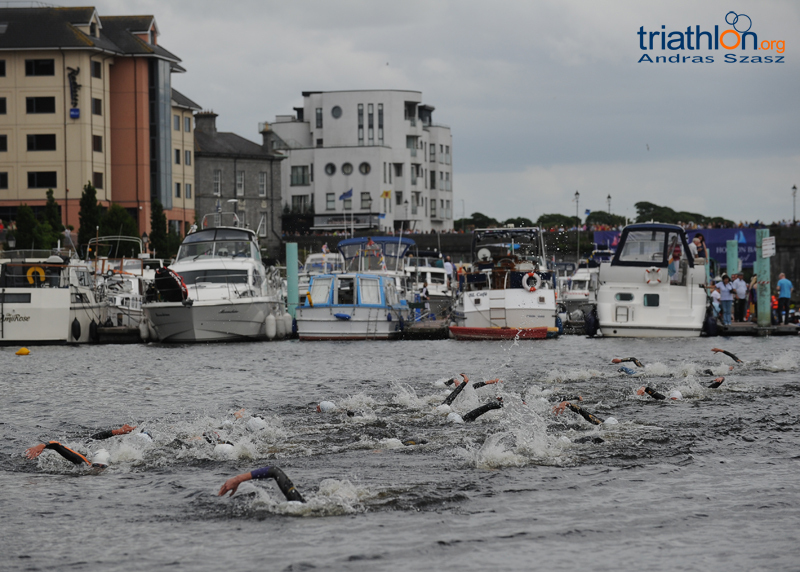 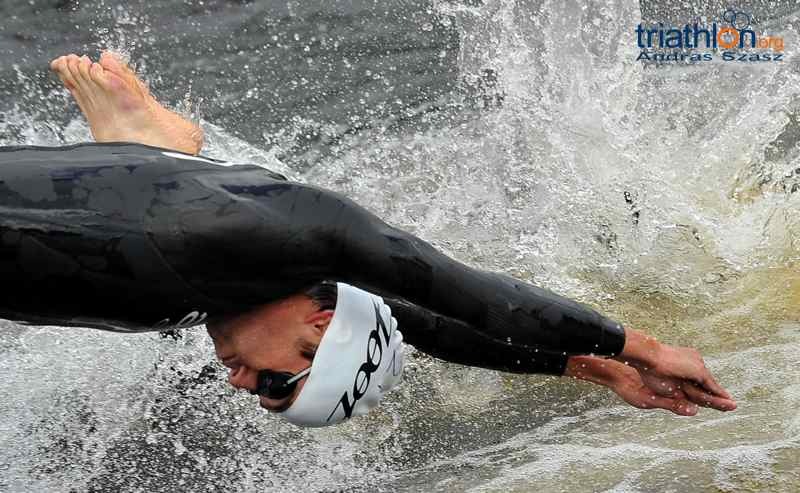 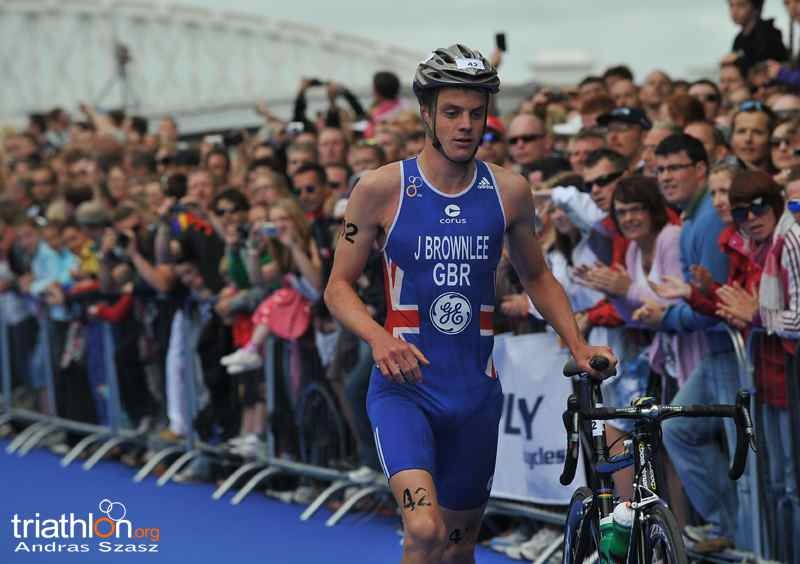 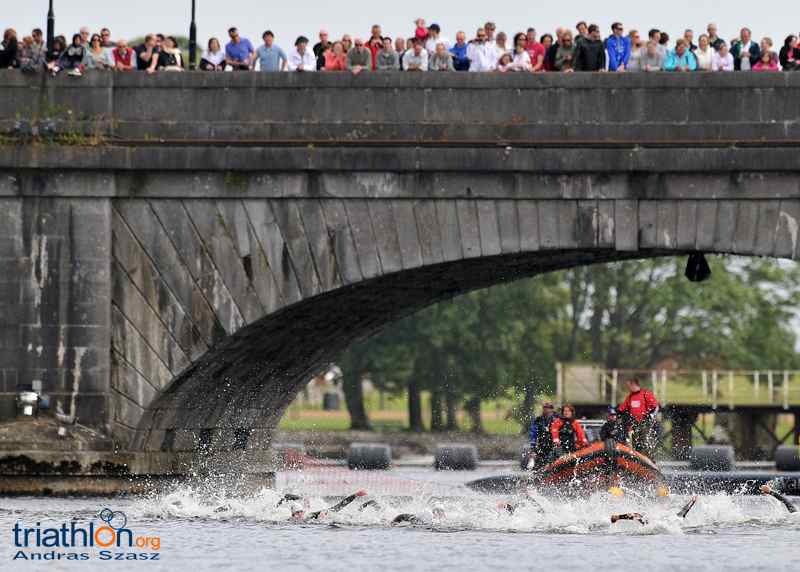 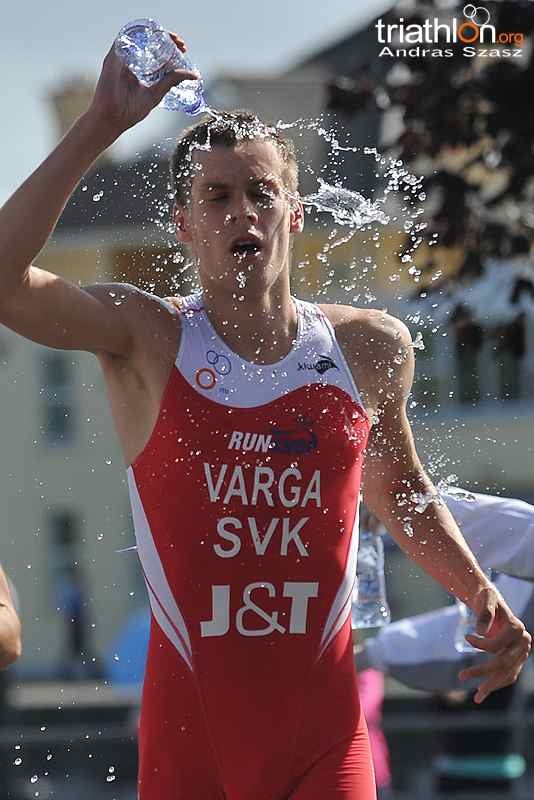 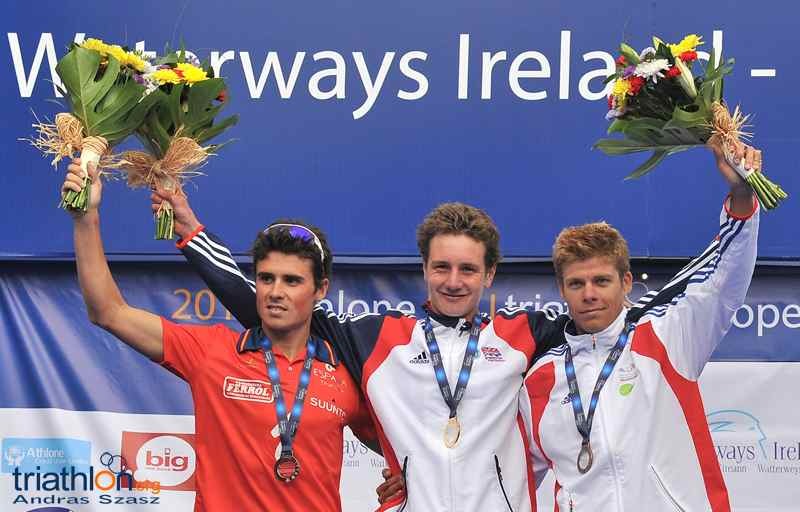 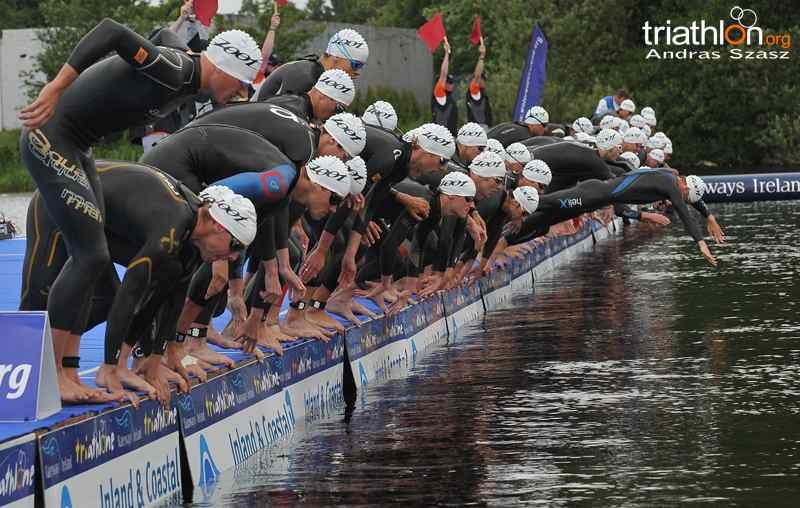 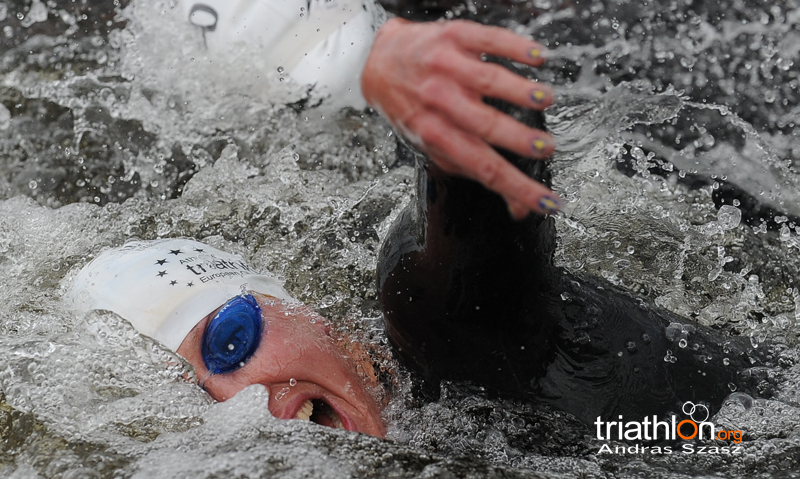 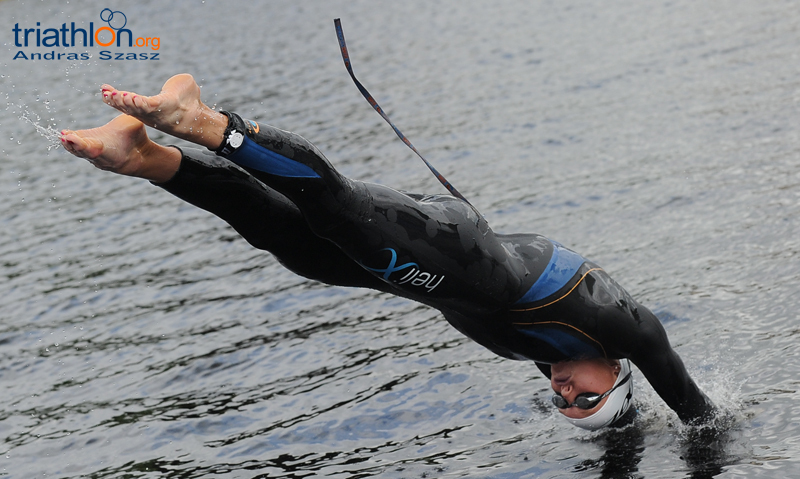 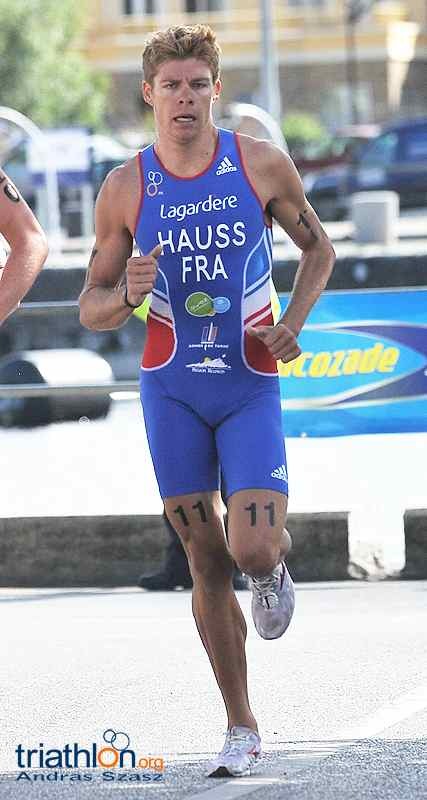 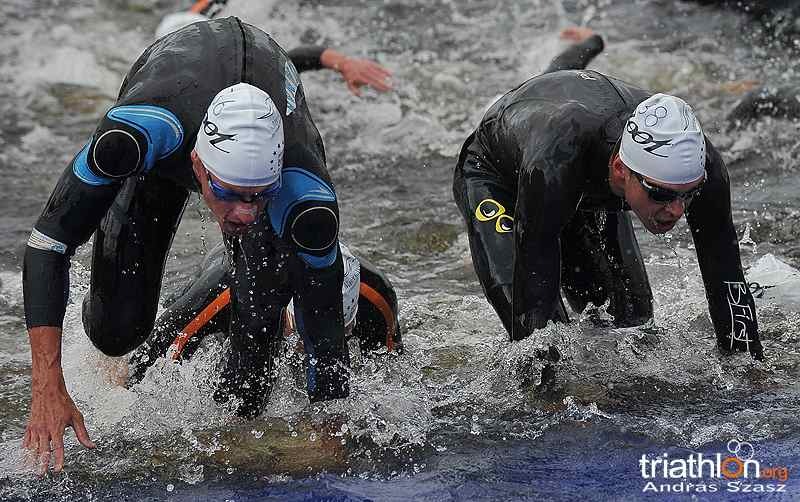 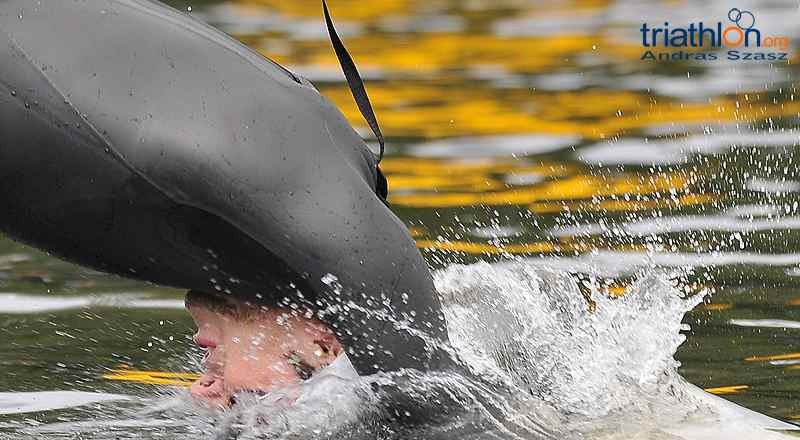 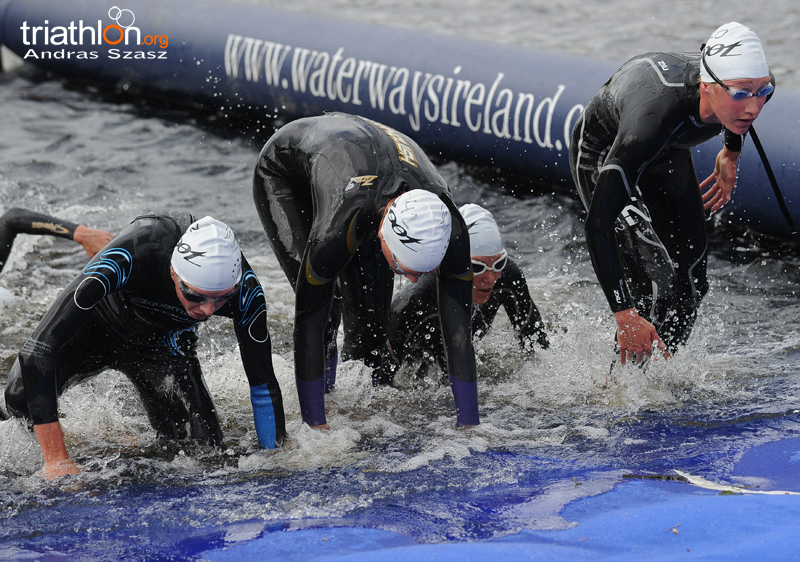 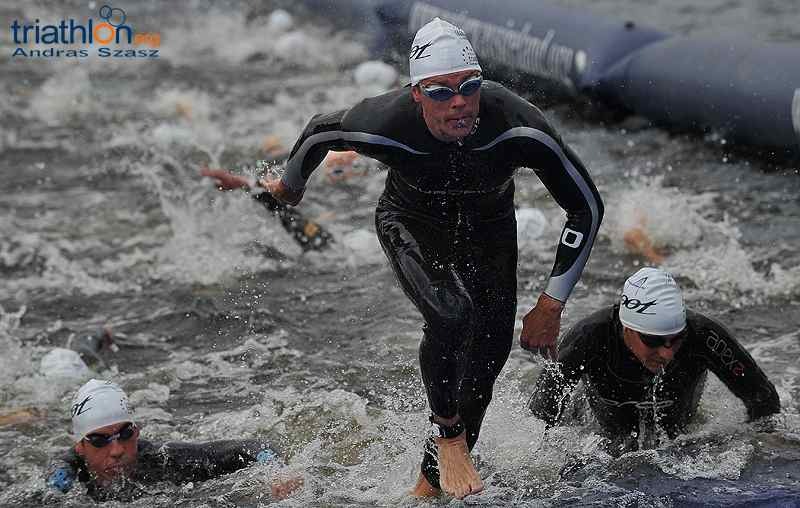 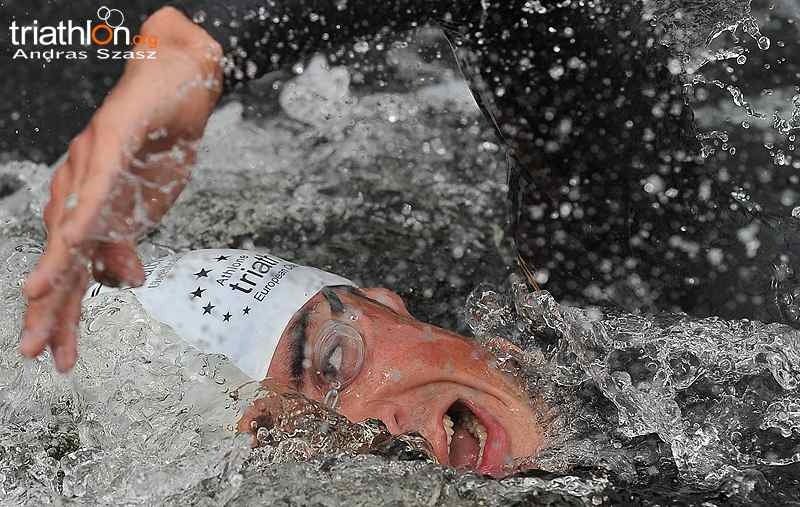 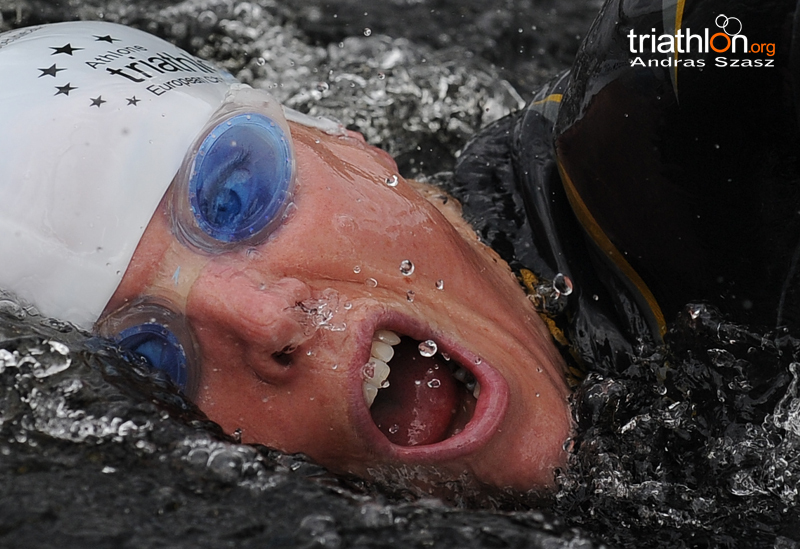 Danish super-swimmer Line Jensen was the first to finish the 1.5-kilometre swim in the River Shannon, exiting the water in 18:11 with a 30-second gap on the rest of the field. 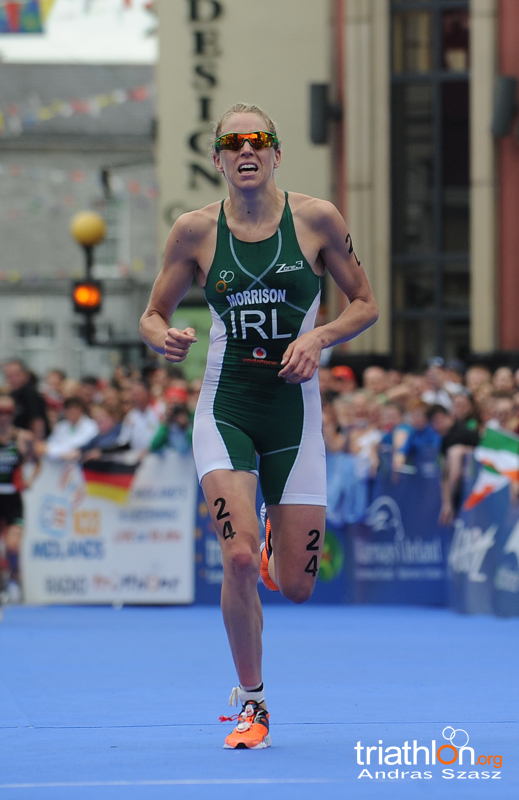 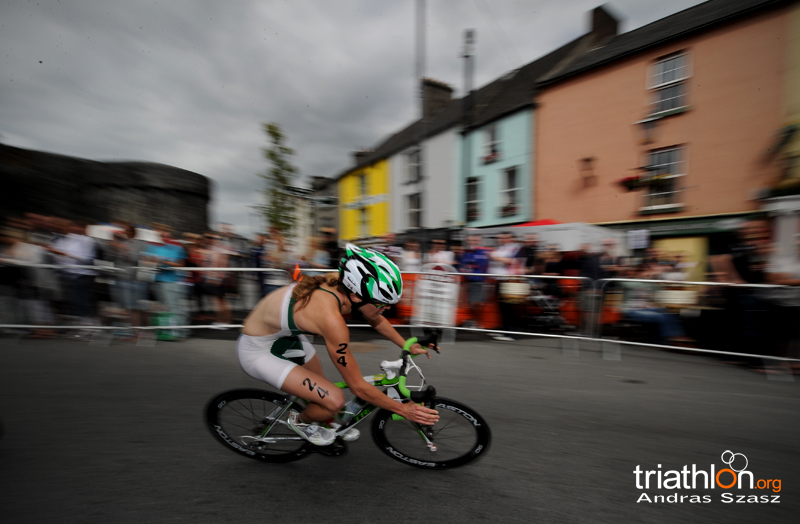 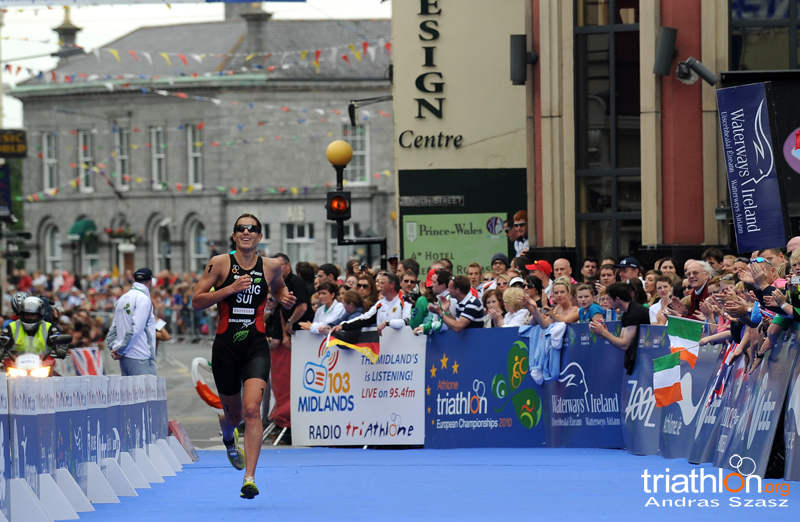 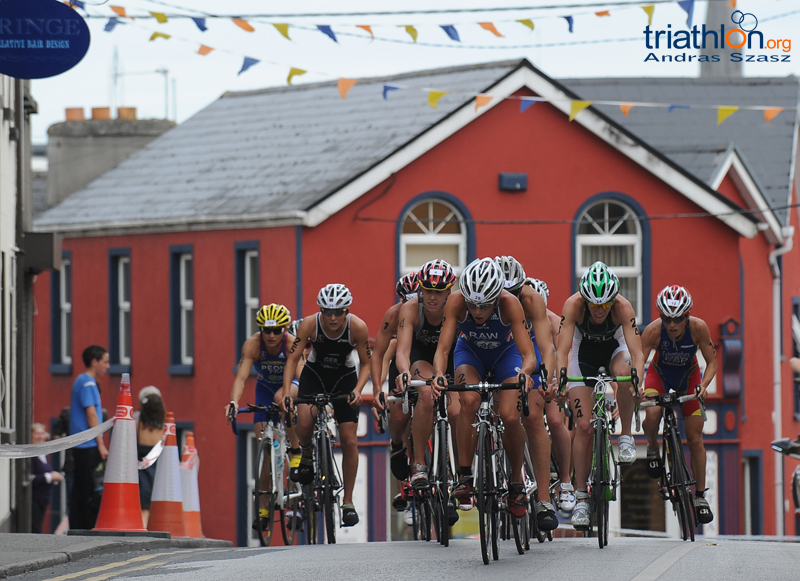 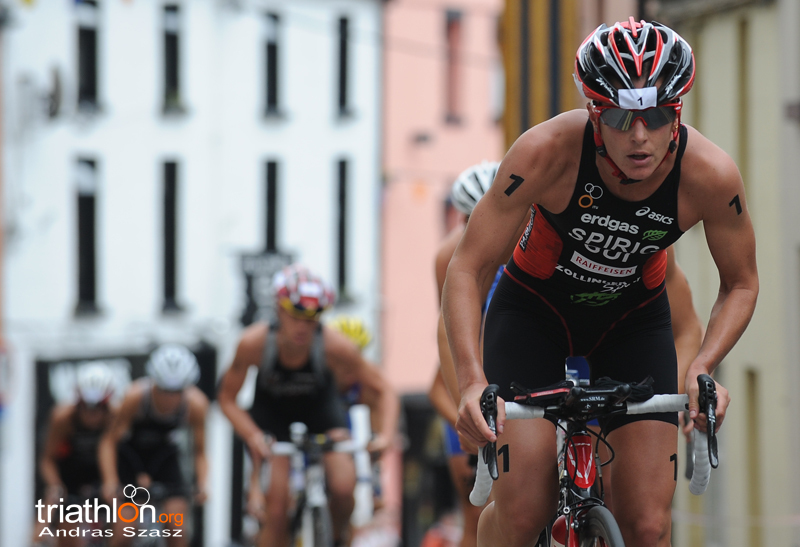 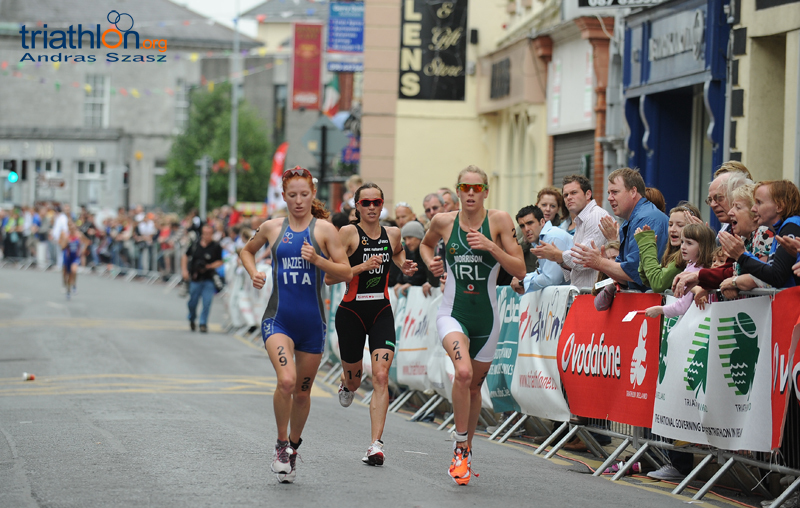 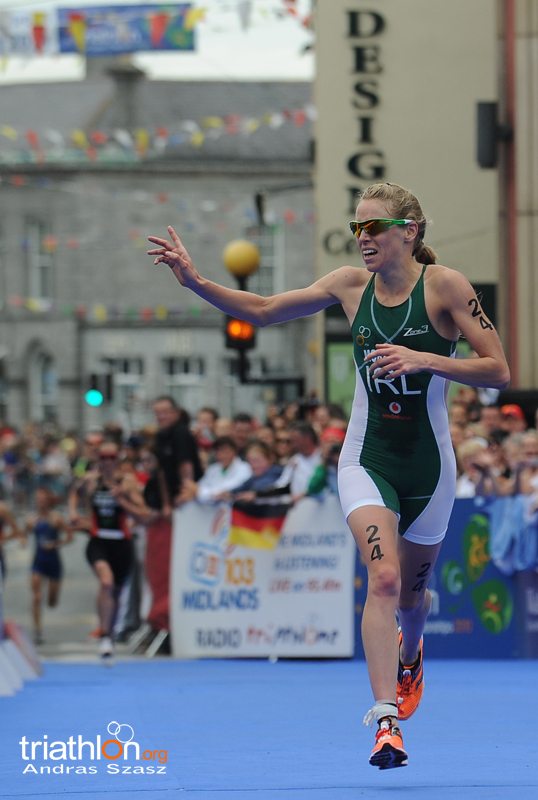 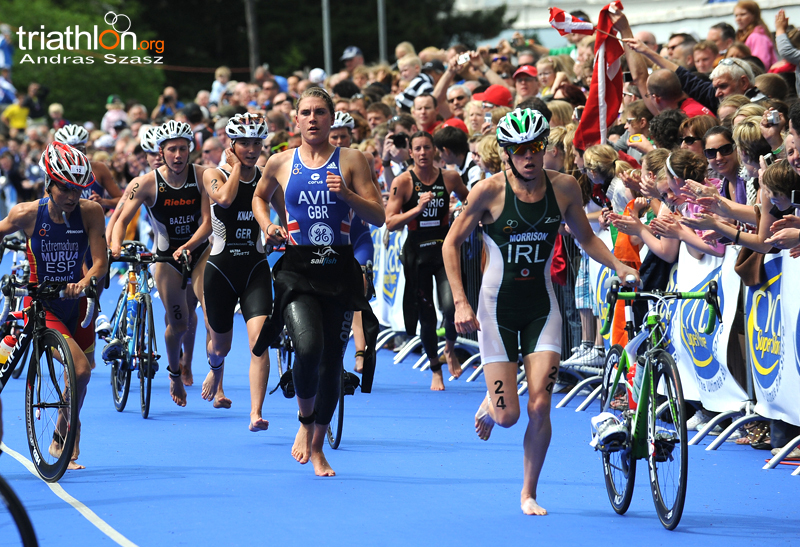 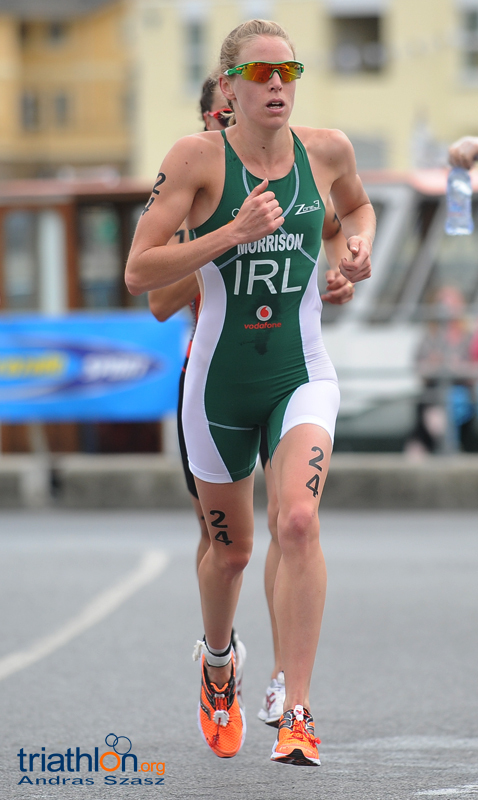 Ireland’s Aileen Morrison was the next woman into transition, with a group of almost 20 athletes right on her heels. 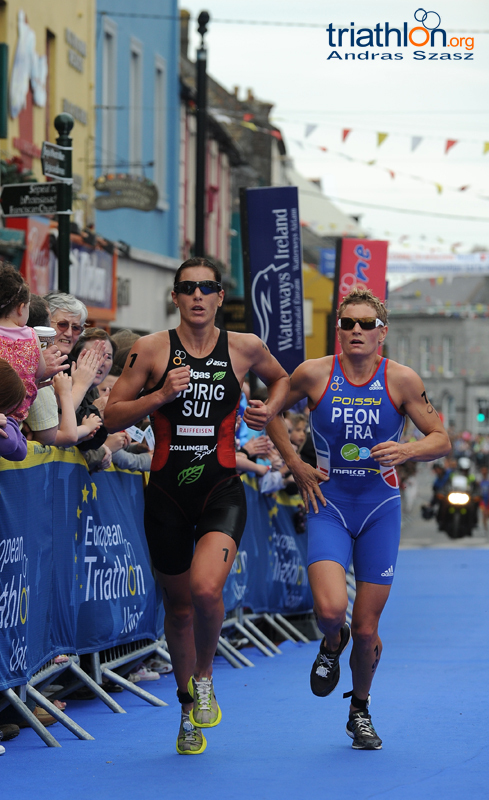 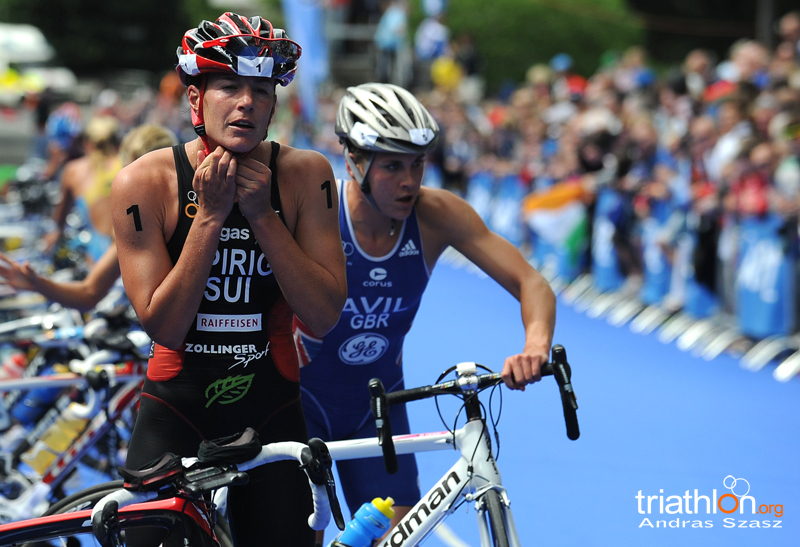 Spirig and Sweden’s Lisa Norden, the two pre-race favourites, set out on the bike in the tail end of the main group. 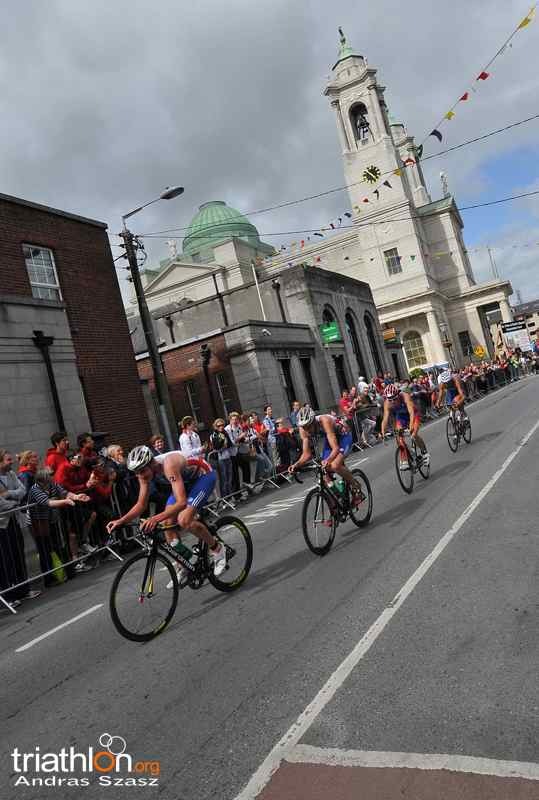 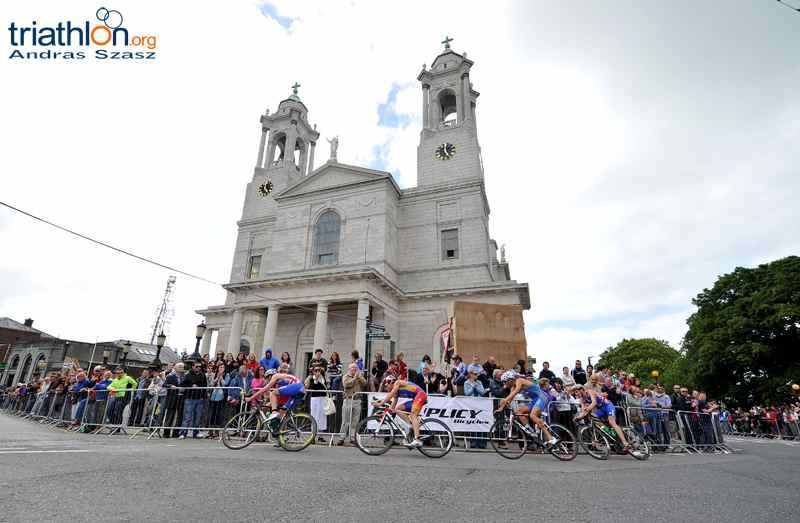 Halfway through the 40-kilometre bike leg Jensen had been caught and a lead pack of 17 women emerged, building a lead of almost 90 seconds on a chase group of 14 riders. 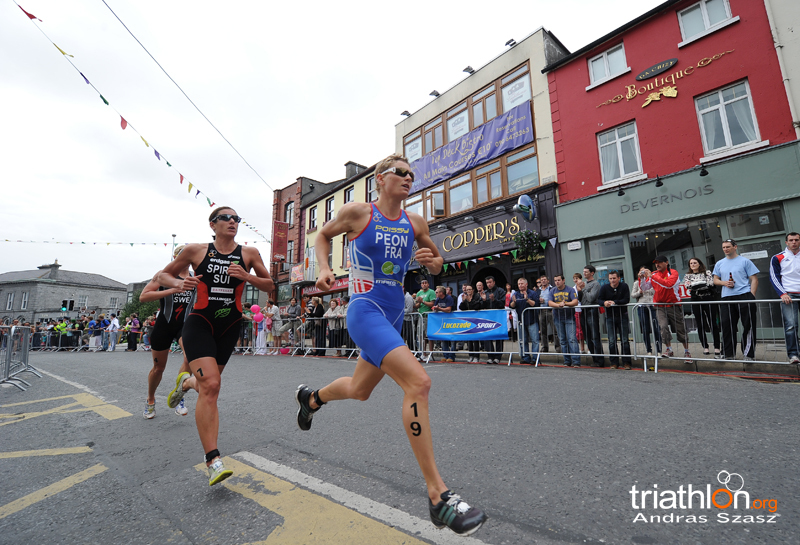 The leaders held their lead to the second transition, with Spirig, Peon and Norden flying through transition to take the early lead on the run. 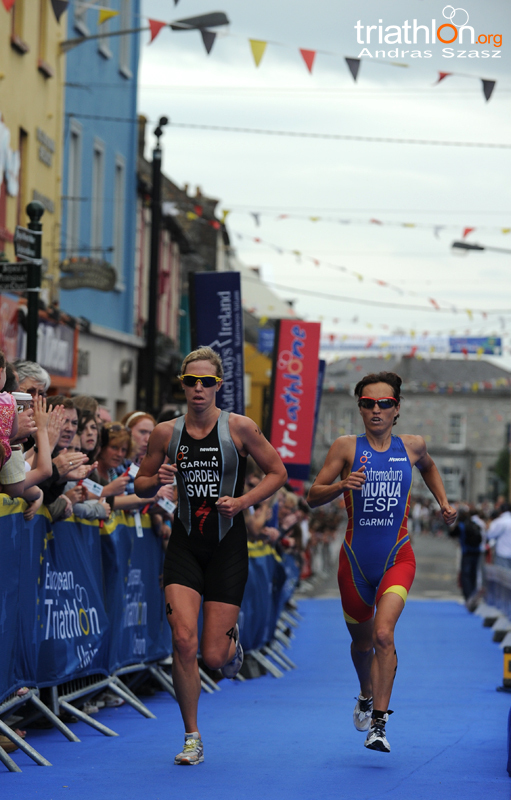 At the midway point of the 10-kilometre run, Spirig and Peon ran neck-and-neck at the front, with Norden and Spaniard Ainhoa Murua running in third and fourth, respectively, only seven seconds back of the leaders. 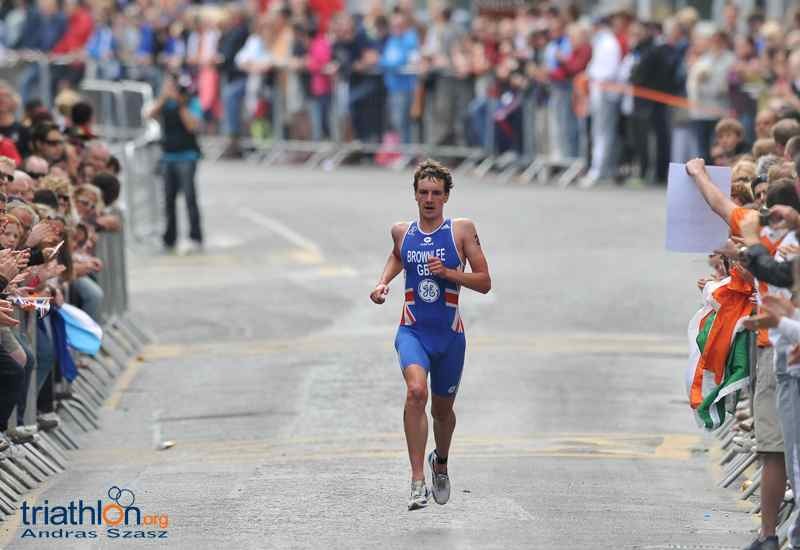 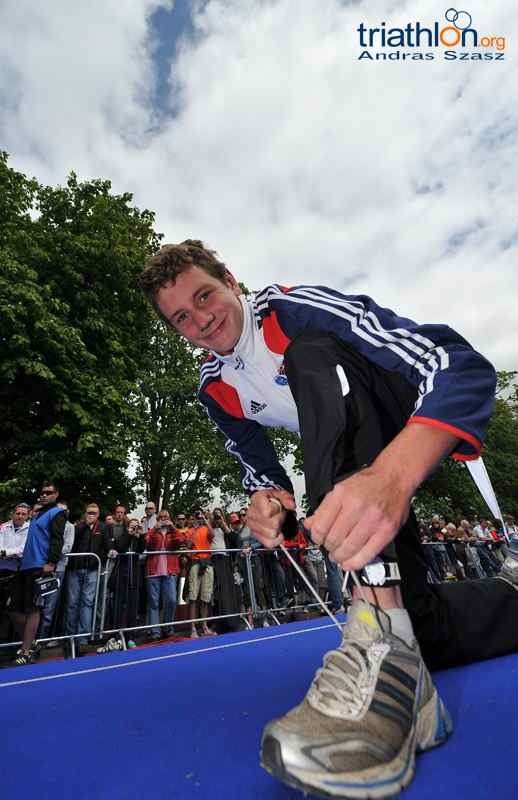 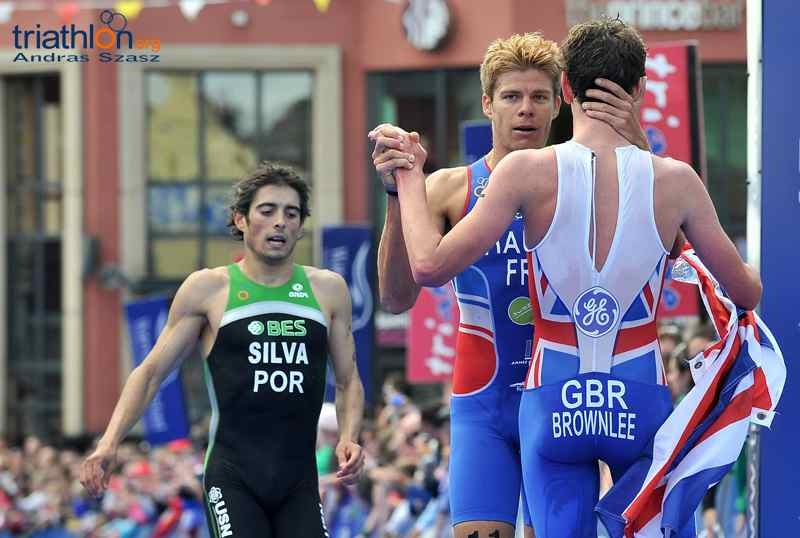 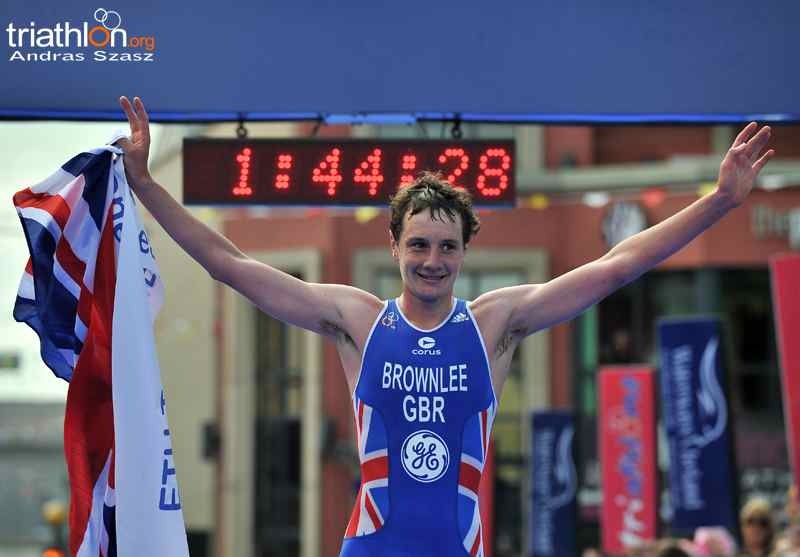 The reigning European champion broke away from Peon in the final kilometre to win in 1:57:58, with Peon holding on for second. 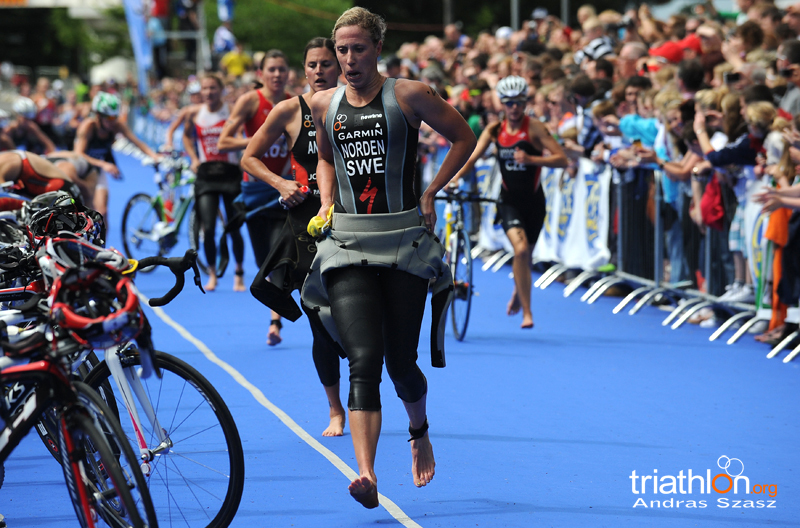 Norden rounded out the podium, finishing another ten seconds back of Peon.